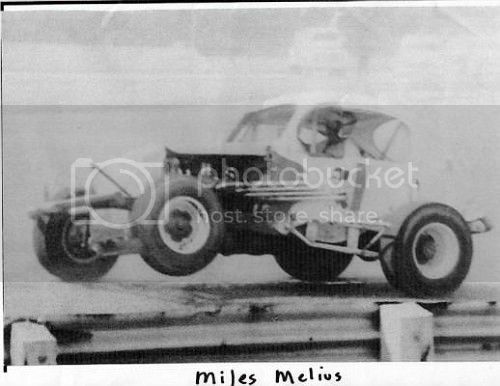 Miles "The Mouse" Melius Next to a Cadillac powered Henry J like he drove to many wins in 1957. The Mouse is still acive in the local racing, attending races every week and many Vintage events throughout the summer. A CADDY POWERED HENRY J??? HOW COOL IS THAT!!??!!?? "The Mouse" was popular and very successful in Eastern Wisconsin modified racing--equivalent in that part of the country to Fritz Wilson, Rick Carelli, and Wayne Stallsworth in Denver area. Neat car, a Caddy and a Henry J, I like it. It is different. What type frame does it have? I have a Henry J model car body, I can add that to my builds. Thanks for sharing the picture, John, I grew up watching the Mouse, first recollections were around 61-62, I think. Thanks for letting me wax nostalgically! Well I am certified to post pictures, now, so here ia a shot of the first "Mouse" car that I can remember. My friends and brothers called it the forty ford, because it looked like a cut down sedan, not sure what it really was, though! Anyway, first memories! This is why every young kid (and adults) loved the mouse! His three-wheelin' style was awesome! 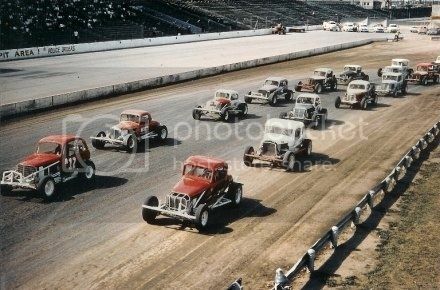 Pace lap State Fair Park Feature. Don't get any better then this! Thanks for letting me hijack the thread, John! Slim, this actually was a 40 Ford sedan body cut down. They called it a coach. This is the car that the Mouse got hurt in. He hit the wall head on during qualifying going an estimated 85mph. He flew completely over a road grader parked outside the wall. He had a broken jaw, wrist and had cuts and bruises. Went to the hospital and came back to the track the same night and was signing autographs. How tough is that? I was there that night and will never forget it. If I could figure out how to post pictures I would. Do you still live in Wisconsin? I was there that night, too, John, tore me up watching that wreck! Then he shows back up! That is tough! I have lived in Memphis now for the last 15 years, retired from the restaurant business in 97 (Did my chef's apprenticeship at the Pfister Hotel) and now play music , full time, for a living. Such as it is! lol Lots of memories of the MSC era of racing. 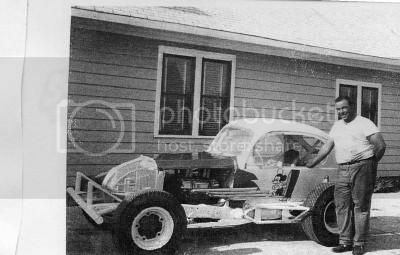 My older brother raced a 53/4 Chevy sportsman he bought from Roger Regath, Paul Feldner used to come around the house, Roger Plautz and Tim Lipski and myself all built models together as kids, before I turned to rock'n'roll and they started racing! I tried to be a sign painter, Artie Dexter was my hero, lettered a few sportsmen and a modified before I realized I wasn't that good! Wow, Small world Slim. I have Paul Feldner's modified (Champion Chicken) from 1965. Also have a Frank Smith 57 Ford tribute car. I am currently working on a replica of Mouse's car from 1961. We put out a bi-monthly newsletter about the short tracks in Southeastern Wisconsin. We also have a Hall of Fame in Hartford WI. now too. Lots going on around here. I see Mouse all the time. Probably will have breakfast with him this weekend!